COMMENT #1: You were right. You said there would be a political change here in Malaysia in 2018 at your Bangkok conference. How do you do this? I am coming to Singapore. COMMENT#2: Wind of change has swept through Malaysia on May 9th as incumbent Barisan Nasional (BN) coalition 61-year rule since 1957 Independence was ended after people rose up to reject a super corrupt and tyranny regime. An opposition coalition called Pakatan Harapan (PH) form a new federal govt, the first time in our history we have a peaceful transition of power. People are fed up with BN blatant corruption like 1MDB scandal, abuse of power whereby cases of whistleblowers that expose politicians corruption are charge and sentenced to jail while the perpetrators still walk free and holding senior govt positions! But the hard work has just begun as the new govt inherit a mess from decades of mismanagement, corruption, and abuse of power. Reform in judicial, executive and legislative branches are badly needed. Also, our country is facing a severe debt crisis due to our corrupt politician’s insatiable appetite to borrow. Socrates forecast of this global trend is indeed amazing. A new Malaysia is born. REPLY: Malaysia’s former leader Mahathir Mohamad, 92, won the election last week, which has shocked everyone for they said it could not be done. This election is part of the same movement globally where we are witnessing a rising up of the people against the corruption of governments that have been ruling in general since World War II. This wave of political change brought Trump to power, BRXIT, Hungary election against the EU, Catalonia rising up in Spain, and the Italian election just to mention a few. This year, 2018, in the case of Malaysia, was 72 years from the April 1st, 1946 event when the Straits Settlements were dissolved and replaced by the Malayan Union, which was conceived to unify the Malay Peninsula under a single government. Then in 1956, a constitutional conference proposed the appointment of the Reid Commission to devise a constitution for a fully self-governing and independent Federation of Malaya. In February that year, talks between representatives of the government of Malaya and Malayan Communist Party sought to resolve the Malayan Emergency situation. Therefore, 2018 was on a very simplistic way, the convergence of two important cycles – the 72-year cycle and two Pi cycles of 62 years. However, we will see the culmination of the full political reform finally come to pass in 2043. Malaysia is still in the transition period. Do not expect the corruption to go quietly into the night. The corruption in Malaysia was far deeper than anyone suspected. I explained that previously and the involvement of Goldman Sachs. True, this has been a political earthquake that toppled the scandal-plagued premier. Ousting his regime that has ruled for over six decades is easier said than done. Behind the curtain, there are way too many bureaucrats who benefit from the corruption. 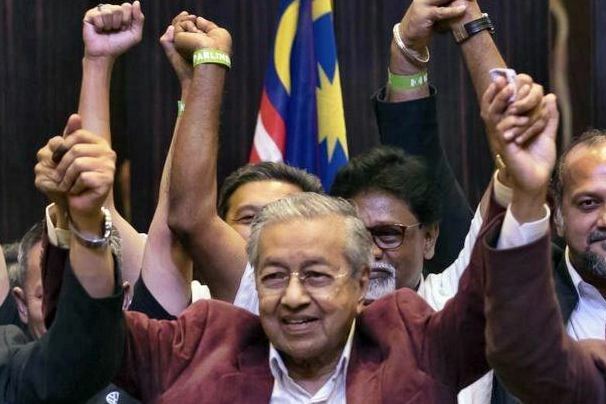 So while the people delivered a political triumph that, like Trump, almost no one had predicted, the end of the grip of the power of the Barisan Nasional party which has ruled Malaysia since its birth as an independent country will indeed be a struggle going forward. Mahathir previously ruled the country with also an iron fist for 22 years. You can replace the head of state, but the corruption never ends there. It has infected every possible level of government. This is why revolution often ends up the only final recourse because the bureaucracy is far too often the real problem. So the final victory will come more likely in 2043. « The Souvenirs of Public Political Executions?